These are very pretty designs to use for making cards. MY FAVORITE THINGS-Die namics Dies. These steel dies will cut through cardstock; thin chipboard; 1/4 inch cork; felt; acetate; sticky back canvas; fabric; denim; sandpaper; 2mm craft foam; wood veneer paper; photo magnet sheets and much more. They work with virtually any die-cutting machine that will accommodate wafer-thin dies and are sure to become an essential ingredient in your paper crafting process. 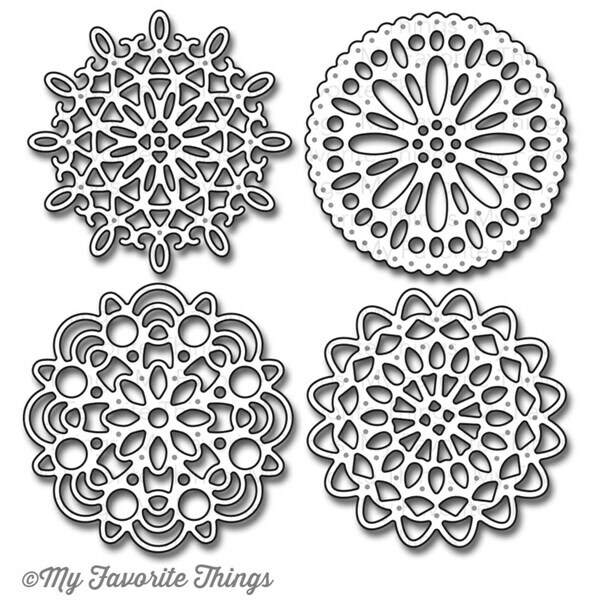 This 7-1/2x4-1/2 inch package contains Mini Delicate Doilies: a set of four dies. These dies make the cutest doilies that can be used on cards or scrapbook pages. I have many, many dies and these are some of the best I've ever used. I love making a stack of these to use whenever I'm ready to decorate greeting card. Ther are also fun for scrapbooking a tea party page. These dies are gorgeous and cut nicely. They can be used in applications other than for snowflakes. I really have enjoyed using them and definitely recommend them. These 4 small doily dies are very charming and really add much to the cards I have created and mailed to friends and family. Make snow flakes, doily's or ??? Just have fun. "what are the measurements (diameters) of the dies?" Hello eballa, the diameter of the die is 1.5 inch. Thank you for shopping with us!